SmartCoverage has already done deep dives into Ontario destinations worth road tripping to in the summer and fall. Time for—you guessed it—winter! These are eight of the most worthwhile winter destinations Ontario has to offer. Ontario is not British Columbia or Alberta. Its mountains can't compete with the behemoths that make up Whistler and Lake Louise. But that doesn't mean that its top ski resort is any less enticing. 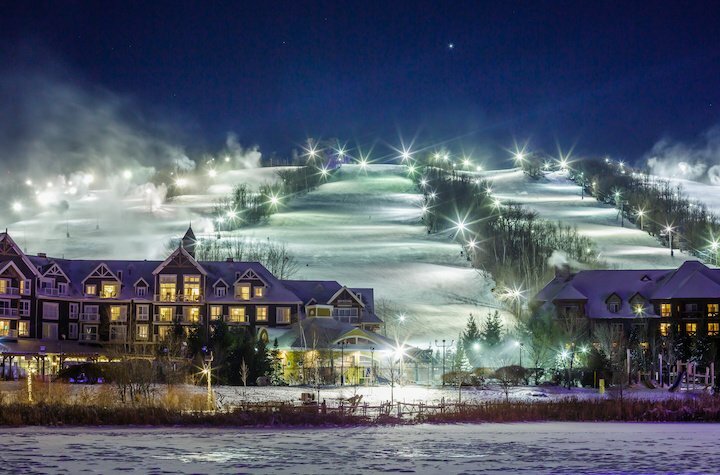 To step into Collingwood's Blue Mountain village is to step into an actual winter wonderland. Its cobblestone streets and brick-adorned buildings converge into a busy village square that gets lit up dazzlingly at night. All around are delicious restaurants, interesting stores, and treats like maple sugar popsicles that get made right in front of you. And even though Blue Mountain can't quite compete with the big dogs out west, it isn't exactly shabby. They are the best Ontario has to offer, both regarding skiing and the après-ski. For those who don't mix so well with downhill skiing or snowboarding, there are still plenty of other winter activities to indulge in nearby. Whether it's outdoor fare like cross-country skiing, snowshoeing, winter caving, dogsledding, and traversing the massive suspension bridge that remains open year-round, or sticking indoors by the fire or at Blue Mountain's renowned Scandinave Spa, it's hard to have a bad winter day up in Collingwood. Our nation's capital is a place to visit all year round, but there's a special charm to visiting in the winter. Nowhere is that truer than on the Rideau Canal, the winding 202 km stretch of skate-able ice that guides you through the heart of the historic city. Voyaging up and down the canal is an ideal way to spend a winter day with significant other, group of friends, or even by one's self. Take it at your own pace, and if you're feeling up to the task, chow down on a Beaver Tail, the unparalleled sugary dessert that conveniently gets sold on the side of the Canal. For those seeking even longer and winding adventure, cross-country skiing down the Ottawa Greenbelt makes for a nice doubleheader. The Greenbelt's 100+ km of trails extend outward from two points on the St. Lawrence River and border the city centre. Try one, or maybe even go trail hopping, before settling down for the day and enjoying a winter evening in the always accommodating capital. Cobourg is one of those quaint towns that often gets lost to Ontarians in the shuffle between Toronto, Kingston, and Ottawa; but to dismiss it is your loss—especially in winter. Outdoor enthusiasts will be pleased to spend time doing winter activities in the nearby Northumberland and Ganaraska Forests, while everyone can have a good time scouring the town's cosy coffee shops and independent stores. Best of all for a winter getaway is a visit to Ste. Anne's, one of the top-rated spas in the entire country. It specialises in wellness, hosting all sorts of classes and retreats throughout the year, making it a nice escape that doesn't require too much driving from any of Ontario's major cities. Believe it or not, Owen Sound, the town that serves as a gatekeeper between the Bruce Peninsula and the rest of Southern Ontario, is home to 25 km holiday lights trail. Winding through Owen Sound's harbour, riverbanks, downtown core, and residential neighbourhoods, this 30-year-old tradition is probably unlike anything you've ever seen before. Be sure to visit before Jan. 7, when the cavalcade of lights and holiday displays disappear for another year. Another reason to visit Owen Sound is to explore its "Jewel in the Crown." More formally known as Harrison Park, it is a massive park that intersects with the Bruce Trail and just so happens to house one of the most picturesque public skating rinks in Canada. No, this is not just 'Bizarro Ottawa,' it is a town in Northern Ontario where you can find one of the more highly rated yurt rental spots around. At the Buffalo Farm Yurts, you can go 'glamping' in style. For however many nights you choose, you'll be free to unwind in a luxury tent-like yurt that features exquisite furnishings and a rustic wooden fireplace (with a chimney, of course). During the day, get out and explore the striking farmland, which includes a herd of bison to hang with! Guests can also ski, snowmobile, dog sled, fish, and visit a traditional Indigenous art gallery. Some may be reading this and wondering why anyone would ever want to trek out to Thunder Bay in the middle of winter, but the answer is simple. Two words: Sleeping Giant. Many will remember Sleeping Giant as the indie Canadian coming-of-age film that was released in 2016 and drew quite a bit of critical acclaim. Its name comes from Sleeping Giant Provincial Park where it is set, a natural landscape that is every bit as acclaimed as the film. Winter sights are stunning up there, highlighted by the sea lion-shaped rock formation that juts out onto one of the park's lakes. Come during the winter for the snow leopard/sabertooth tiger version of this feline formation. Torontonians may be miserable for much of the winter—especially those that spend big chunks of their days commuting through cold, slushy streets or being packed onto buses and subways like overheating sardines—but they should stop and appreciate sometimes how beautiful their city can be during the coldest days of the year. Even though the gorgeous Christmas Market only lasts for a few weeks, the Distillery District—with its art galleries, shops, theatres, installations, and neat restaurants—retains its allure all winter long. Then there's the city's array of beautiful public skating rinks, which starts with the ever-popular one just outside City Hall, and its smattering of ravine-enabled toboggan hills (head over to Riverdale Park off of Broadview and thank us later!). Plus, when you want to go out but also spend the day/night in total warmth, its easy to find a coffee shop or night time destination (theatre, concert hall, bar) that can meet your needs. This scintillating summer destination has plenty to offer during the winter as well. Let's start with the natural attractions. The Highlands region encompasses the southwestern edge of Algonquin Park, as well as all of Oxtongue River-Ragged Falls provincial park. Both are well worth a visit this time of year, as the snow sets a stunning winter scene for hikers, cross-country skiers, and those brave enough to camp. Ragged Falls (the waterfall) in particular is a sight to watch out for. Also highly recommended is Winterdance Dogsled Tours, one of the province's top bets for a dogsledding experience. If you're making it a multi-day trip, you will have no problem finding a place to stay, as there are plenty of top-notch resorts in the area that stay open year-round.